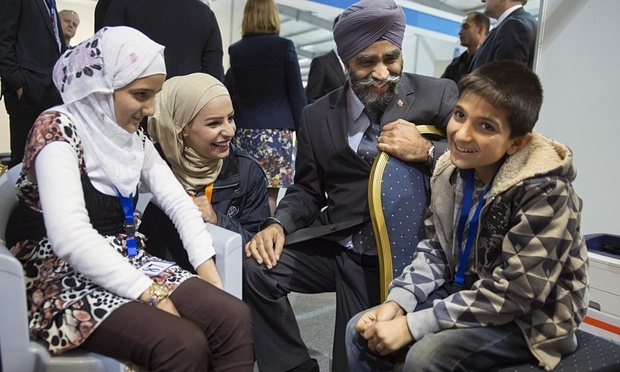 Canada’s Minister of National Defense, Harjit Sajjan meets the first Syrian refugee group that will eventually total 10,000 by the end of 2015. A meeting co-chaired by the Honourable John McCallum, Minister of Immigration, Refugees and Citizenship Canada (IRCC), and the Honourable Michael Chan, Ontario Minister of Citizenship, Immigration and International Trade was held following the December 1st Forum on Welcoming Syrian Refugees to Canada. At this meeting Federal, provincial, and territorial (FPT) ministers, responsible for the immigration of incoming Syrians, gathered to reiterate their commitment to resettling Syrian refugees across Canada. Understanding the tremendous national effort needed they discussed where the incoming Syrians will go and what support those communities receiving refugees should have in place for them. The Hon. John McCallum was able to share in his first hand experience at the December 1st meeting. McCallum, along with the Honourable Jane Philpott, Minister of Health and Chair of the Ad Hoc Committee on Refugees, and the Honourable Harjit S. Sajjan, Minister of National Defence, traveled to Lebanon, Beirut on November 29 to experience first hand the situation. They spent time at Za’atari, a refugee camp of approximately 80,000, home, speaking to refugees, some who have been displaced for years. The Ministers also spent time with Canadian officials at the processing center in Ammen reviewing the interview and screening processes. The goal is to bring in 10,000 Syrian refugees by December 31st. Currently, there have been 1,451 permanent visas issues with 11,932 applications in progress according to new figures released at a briefing in Ottawa. According to McCallum, they are processing about 800 people a day, a pace he believes can keep up.